One of the by-products of cleaning out our basement is now I have about a dozen huge boxes of unlabeled and unsorted photographs. Luckily they are in clumps or groups that were taken about the same time. Now, what am I going to do with them? I don’t have the heart to throw them away. But wait! Yes I can. I can scan them, put them in a digital image state and then throw them away. So, for posterity purposes I am hiding them in digital maze that will probably never be looked at again but might be around longer than the human race. .. but they could be looked at again – but why? This will be these pictures last hurrah for a long long time. 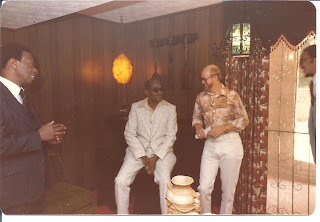 I took these pictures in the late 1970s at Sandra’s house. Just by Mr. Harley handing Joe some kind of plaque with his name on it I suspect it is an unsanctioned retirement ceremony. All of them were my co-workers in the Time Keeper Data Collection Site. The lady above on the right pinning something on the other lady is my old buddy and co-worker Alice. Alice was one week older than me. She lived a fast life. She was always late. If she was so fast how come she was always late? That is because she also lived a disorganized life. I will always think of her with her red wig tilted on her head and one closed because the smoke coming up from the cigarette in her mouth. Alice also had a drinking problem. Alice had a heart of gold. She died of a liver disease. We knew her as Alice. Her husband, 3 kids, and 19 siblings knew her as Barbara Jean. I think the other lady, the pinee, is Joe’s wife. Harry is dead too. 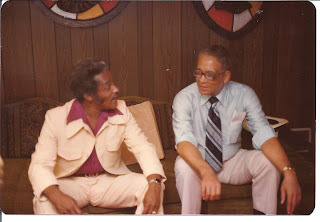 Harry used to like to tell me what kind of mess his son got into, or as he used to say, “that boy of mine…” His son was about 25 and lived at home. I met his son once – that boy of his just didn’t seem to have the enthusiasm or gumption to find a job or move out or ask a girl for a date. Mr. Harley was very scholarly and very courtly. He seemed always very gentlemanly to make every feel comfortable. Numeric-wise, I think his time on earth has come too. Who is not pictured because he wasn’t there was Mr. Jonas. 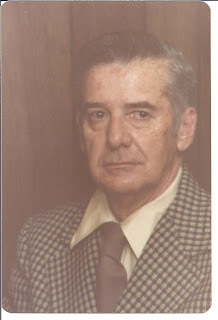 Mr. Jonas was Wayne Williams Sunday School teacher. He felt strongly Wayne Williams was innocent but got railroaded because of a screaming public. Popcorn did not like me very much to start off with. It took him years go adjust to me. His wife was murdered and I sincerely felt his grief. I got emotional when I told him how sorry I was. We spoke on friendly terms after that. Santes is the guy in the middle. He was a supervisor by default. Santes was easy going and was constantly getting chewed out by the person over him. But he kept on smiling. Santes wife was a postal clerk who looked mean enough to eat nails and spit out the pieces in your face. The guy on the right is Chuck. Chuck was a ladies man. He thought he was a ladies man and he was. He had several female friends at the Atlanta Post Office . He thought therefore he was? Is that the way it was. He was also a smooth talker, who seemed to talk more than he worked. About ten or so years after I transferred to Marietta one of our ex-coworkers called me and said Chuck was very ill and it was doubtful if he would live much longer. I called him and he was so much out of it I am not sure he knew who I was or not. He died less than a week later. Sandra was the hostess of this get-together. Sandra was very outspoken and once got fired for fighting a supervisor. Later, she got her job back because it was proven she could not have slugged him, based on the facts he said, thanks to my photographs. I always admired William. He was a hard honest worker with scruples you wouldn’t believe, yet he didn’t make a big deal of his high morals. 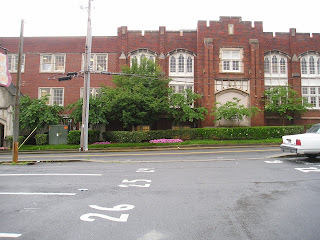 One time at the Parcel Post Annex which was miles away from the Atlanta Post Office it was discovered that the timekeepers were doing every thing wrong, and abusing their position. They all were fired and William and I were sent in to run the time keepers office until a new crew could be trained. For several months William and I each worked 12 hours a day, relieving each other, 7 days a week, everyday of the month, for a couple of months with no time off what so ever. Life pretty much sucked then. His initials were WAP, which is what I called him. Sully was very outspoken in a loud manner. You might say he was usually negative in a positive manner. One time Sully and several of his friends pooled their money and bought a bus. They had plans on using it to carry clubs or organizations to special events. Everyday we got to hear of new problems their bus and their clientele were causing. I think they finally sold it to recoup some of their investment. One time during a storm a tree fell on Sully’s house. He climbed on top of the house with a chainsaw to cut the limbs in smaller more manageable pieces. He almost did the same for him leg and arm. He had a chain-saw accident which almost killed him. When I transferred to Marietta he was still out. Now, these pictures, like some of their subjects are put to rest. In Marietta, downtown right in the middle of the town is Glover Park. In the warm months there is a concert every Friday night. Anna and I have been going since they started. We don’t make every concert but we make most of them. Ever since the first one we both notice a man who is always dressed the same: plaid Bermuda shorts and black socks. He is middle age. He is always alone. He always takes a strong through the park just over the half-way point. 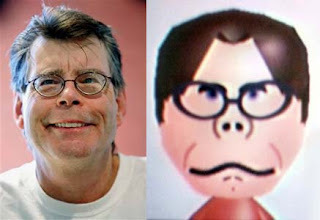 He looks very much like Stephen King. There was too much music and noise for him to hear us. He stopped. Across the walk from us was an empty park bench. He sat down and seemed to be looking right at us for five or six minutes. He didn’t seem any hurry to get up and get back on the move or maybe prowl. He looked like he was studying us. His facial expression was puzzlement, like trying to reach out to us, mind-wave wise. Fortunately, I think his mind ran into a cement wall. Then he got up and walked away. The Good Old Boys and Girls Tuesday night get together minutes for September 29, 2009. Paul Roper had people that knew and remember Geri Bundesman to autograph a glossy black and white picture of her and her husband. But seriously, I think we can say attendance was between 35 and 37. The food was plentiful and juicy, spicy, and all else that goes with a good meal. And we had peach ice cream too. Rupert served. One person ordered his food to go. This is Paul Roper’s car. Notice the spattered bug on the hood. Noticed how well polished and shiny it is. Notice the handsome photographer’s reflection? Or it might look sort of like a giant splattered bug. I haven't tossed any genealogy information onto this blog for over a week. It is long overdue. We are still looking at my PETTY surname. 290. MAUD LEICHER9 CAMPBELL (LEROY MALCOLM8, LEROY MALCOLM7, NANCY6 PETTY, ABNER5, ZACHARIAH4, JOHN3, THOMAS2, HUBERT1 PATEY) was born Aft. 1890, and died Unknown. She married MR KLEINE. 348. i. HARRY W.10 KLEINE, b. Aft. 1910. 291. HARRY W.9 KLEINE (MAUD LETCHER8 CAMPBELL, LEROY MALCOLM7, NANCY6 PETTY, ABNER5, ZACHARIAH4, JOHN3, THOMAS2, HUBERT1 PATEY) was born 04 Aug 1915 in Las Animas, Bent, Co, and died 1980 in Grand Junction, , Co. He married MARGARET WADHAMS 21 Oct 1932.
i. MARILYN10 KLEINE, b. Aft. 1932. 292. EDNA JOSEPHINE9 HAYHURST (ALSEY JOSEPHINE8 PETTY, JOHN A.7, JOEL6, JOSEPH5, FRANCIS MOORE4, THOMAS3, THOMAS2, HUBERT1 PATEY) was born 11 Mar 1846 in , Carroll, Ar, and died 28 Jan 1887 in Waelder, Gonzales Co, Tx. She married JOHN C. PEACOCK 10 Jan 1881. 349. i. DELLA NEVADA10 PEACOCK, b. Sep 1868, Elm Grove, Caldwell Co, Tx; d. 16 Jun 1947, Clarksville, Red River Co, Tx. 293. NANCY JANE9 PETTY (ALEXANDER ANDERSON8, JOHN A.7, JOEL6, JOSEPH5, FRANCIS MOORE4, THOMAS3, THOMAS2, HUBERT1 PATEY) was born 24 May 1852 in Pettytown, Bastrop Co., Tx, and died 11 Aug 1867 in , , Tx. She married JIM BLACK. i. UNKNOWN10 BLACK, b. 11 Aug 1867; d. 11 Aug 1867. 294. JAMES LANDA9 PETTY (JAMES MARION8, JOHN A.7, JOEL6, JOSEPH5, FRANCIS MOORE4, THOMAS3, THOMAS2, HUBERT1 PATEY) was born 1860 in Pettytown, Bastrop Co., Tx, and died 1891. He married ALCENA RIDDLE118 14 Sep 1880 in , Caldwell Co, Tx, daughter of HARVEY RIDDLE and MARY. She was born 1862 in Pettytown, Bastrop Co., Tx, and died 1947.
i. EDGAR10 PETTY, b. 1886, Pettytown, Bastrop Co., Tx; d. Unknown. ii. CHLOE ESTER PETTY, b. 1888, Pettytown, Bastrop Co., Tx; d. Unknown; m. EDDIE BAIZE. 295. JASPER NEWTON9 PETTY (JAMES MARION8, JOHN A.7, JOEL6, JOSEPH5, FRANCIS MOORE4, THOMAS3, THOMAS2, HUBERT1 PATEY) was born 24 Aug 1864 in Pettytown, Bastrop Co., Tx, and died 12 Jul 1932 in Red Rock, Bastrop, Tx. He married DORA BEATRICE POGUE 01 Nov 1886. She was born 07 Oct 1867 in Red Rock, Bastrop, Tx, and died 26 May 1938.
i. ANNIE MYRTLE10 PETTY, b. 22 Aug 1886, Red Rock, Bastrop, Tx; d. 14 Jun 1969; m. PERRY PRESTON WILLIAMS, 20 Nov 1904; b. 15 Apr 1882, Red Rock, Bastrop, Tx; d. 28 Jul 1914.
ii. LORA DEANE PETTY, b. 16 Sep 1889, Red Rock, Bastrop, Tx; d. Unknown. 350. iii. 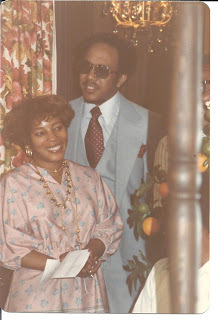 THOMAS EARL PETTY, b. 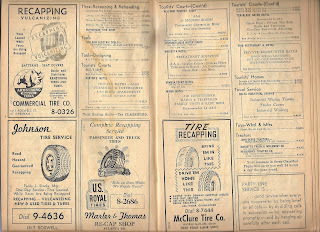 25 Nov 1891, Voca, McColloch, Tx; d. 01 Jun 1950, , , Tx. iv. GRANDVILLE LEWIS PETTY, b. 30 Nov 1893, Voca, McColloch, Tx; d. 18 Sep 1962; m. (1) ETHEL BARNARD119, 25 May 1921; m. (2) MAGGIE VOIGHT120, 12 Oct 1927. 351. v. NOLAN EDGAR PETTY, b. 18 Feb 1900, Red Rock, Bastrop, Tx; d. 08 Dec 1955.
vi. BEULAH ARRENA PETTY, b. 22 Jul 1905, Red Rock, Bastrop, Tx; d. 13 Jan 1987, , Bastrop, Tx. vii. FOY WALLACE PETTY, b. 31 Dec 1907, Red Rock, Bastrop, Tx; d. 03 Sep 1961. 296. THOMAS LEVI9 PETTY (JAMES MARION8, JOHN A.7, JOEL6, JOSEPH5, FRANCIS MOORE4, THOMAS3, THOMAS2, HUBERT1 PATEY) was born 17 Nov 1866 in Pettytown, Bastrop Co., Tx, and died 1945 in Childress, Childress Co, Tx. He married MARY ANN "MOLLY" DESHEA 03 Nov 1895. She was born 19 Feb 1867, and died Bef. 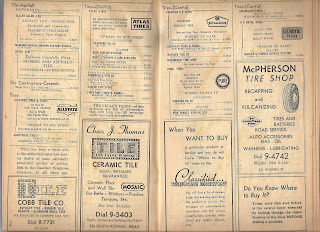 1944 in O'DONNEL, Lynn Co, Tx. 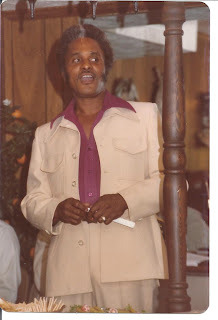 Died in the home of his daughter, Mrs. Arthur Johnson. 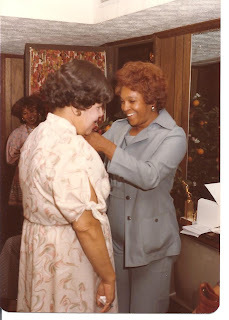 Molly was a small dark skinned woman -- part French. i. CHARLEY IVAN10 PETTY, b. 02 Sep 1886; d. 30 Jun 1888.
ii. ETTA PEARL PETTY, b. 16 Nov 1887; d. 30 Jan 1889.
iii. 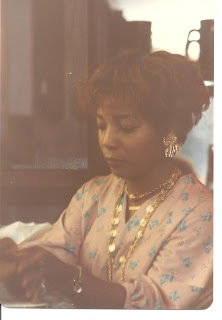 TEMPLE LEE PETTY, b. 13 Feb 1891; d. Bef. 1990, Carlsbad, Eddy Co, NM. iv. THOMAS MARVIN PETTY, b. Aft. 1892; d. Unknown. v. STELLA RUTH PETTY, b. 23 Mar 1895; d. Unknown, Childress, Childress Co, Tx. vi. MARY AMOLINE PETTY, b. 05 Apr 1897, Santa Anna, Coleman Co, Tx; d. 1961, Carlsbad, Eddy Co, NM. vii. RAYMOND HUBERT PETTY, b. 03 Jul 1904; d. 30 Apr 1977.
viii. BERTIE LOVEL PETTY, b. Aft. 1905.
ix. LEON BRIN PETTY, b. Aft. 1906. 297. ANNIE L.9 PETTY (JAMES MARION8, JOHN A.7, JOEL6, JOSEPH5, FRANCIS MOORE4, THOMAS3, THOMAS2, HUBERT1 PATEY) was born 12 Mar 1868 in Red Rock, Bastrop, Tx, and died 21 Sep 1957 in Waelder, Gonzales, Tx. She married JAMES ELBERT PETTY 27 Aug 1889 in , Bastrop, Tx, son of JOHNSON PETTY and CYNTHIA PEACOCK. He was born 02 Sep 1863 in Red Rock, Bastrop, Tx, and died 08 Aug 1946 in Waelder, Gonzales, Tx. i. LULA MAE10 PETTY, b. Aft. 1889; d. Unknown. ii. NOVELLA PETTY, b. Aft. 1889; d. Unknown. iii. BARTON PETTY, b. Aft. 1889; d. Unknown; m. EMMA MANEBY. iv. CHARLIE PETTY, b. Aft. 1889; d. Unknown. v. DESSIE PETTY, b. Aft. 1889; d. Unknown. vi. GLADYS PETTY, b. Aft. 1889; d. Unknown. vii. 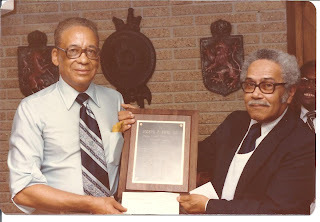 ELBERT PETTY121, b. 22 Dec 1890, , Bastrop, Tx; d. Unknown. viii. JAMES ELLE PETTY, b. 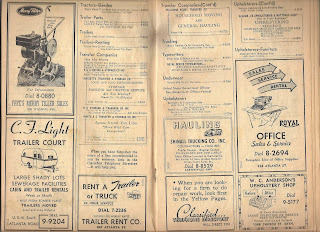 18 Aug 1895, , Bastrop, Tx; d. 1940.
ix. MAYNARD PETTY, b. 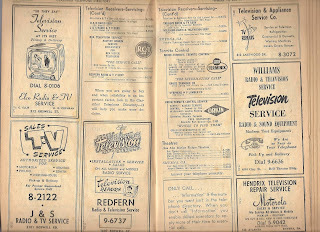 26 Jan 1901, , Bastrop, Tx; d. 15 Sep 1946. 298. ALFRED MANNON9 PETTY (JOHNSON MANNON8, JOHN A.7, JOEL6, JOSEPH5, FRANCIS MOORE4, THOMAS3, THOMAS2, HUBERT1 PATEY) was born 14 Jan 1861 in Red Rock, Bastrop, Tx, and died 13 Feb 1937 in Brady, McColloch Co, Tx. He married SARAH RIDDLES 17 Feb 1886 in , Bastrop, Tx, daughter of HARVEY RIDDLES and MARY SMITH. She was born 28 Oct 1869 in , Bastrop, Tx, and died 14 Nov 1959 in Brady, McColloch Co, Tx. i. EFFIE MAE10 PETTY, b. Aft. 1886; d. Unknown. ii. RUDELLA PETTY, b. Aft. 1886; d. Unknown. iii. JESSE JAMES PETTY, b. Abt. 1888; d. Unknown. iv. SAMMIE DEE PETTY, b. Abt. 1890; d. Unknown. v. TEMPLE RAE PETTY, b. 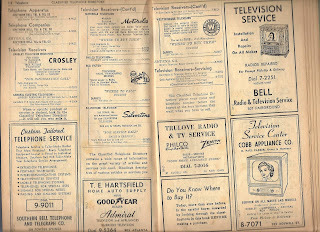 23 May 1906, Brady, McColloch, Tx; d. 27 Dec 1930, Brady, McColloch, Tx. 299. JAMES ELBERT9 PETTY (JOHNSON MANNON8, JOHN A.7, JOEL6, JOSEPH5, FRANCIS MOORE4, THOMAS3, THOMAS2, HUBERT1 PATEY) was born 02 Sep 1863 in Red Rock, Bastrop, Tx, and died 08 Aug 1946 in Waelder, Gonzales, Tx. He married ANNIE L. PETTY 27 Aug 1889 in , Bastrop, Tx, daughter of JAMES PETTY and ARRENA FOWLER. She was born 12 Mar 1868 in Red Rock, Bastrop, Tx, and died 21 Sep 1957 in Waelder, Gonzales, Tx. Children are listed above under (297) Annie L. PETTY. An old high school classmate and I have been emailing. I won’t say “an old high school friend” because back then we were not exactly friends. We ran with different crowds. He ran with the goody-two-shoes crowd and they were mostly running from us. That was a joke. We lived in a détente teenage society. Back then we more or less ignored different bunches…and in turn they ignored us. We were polite. But lately, I feel Brad and I have kindled a friendship. With rumbles of the Bell Reunion on my blog reminded Brad of his days at Larry Bell Park. Actually poor Brad lived on the other side of the tracks. True. The side he lived in did not have the luxury of hours old fresh eggs, or the pleasure of picking out your own live chicken and wringing its neck, or the joyful act of using a Sears Roebuck catalog in the outhouse. And on the Brad’s side of the tracks they had boring Thanksgiving dinners – but on our side Thanksgiving day, if cold enough was a designated hog killing day and that was always fun watching the blood spurt and the guts spill out of the stomach. Brad, had to cross the tracks to his Wednesday night job as an usher at the Larry Bell Auditorium for the wrestling matches events. I had several good reads of him describing the wrestling bouts and challengers and the show of bloated egos. I used to go to the wrestling matches too. My daddy sometime would go and hangout talking local politics while I got into the crowd and made fool of myself. I broke my arm one time there falling off the bleachers. 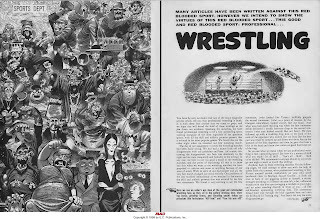 All this wrestling talk remind me of a MAD magazine article that came out written by Harvey Kurtzman and illustrated by fellow Georgian Jack Davis. It was the first issue of MAD as in magazine form. Up until that point MAD was a comic book. 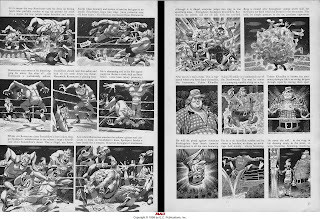 The publishing date is July 1955, the month I turned 14, which was during my Wrestling bout craze. What is Vickory Cab's telephone number? Where was the Apple Cab company? 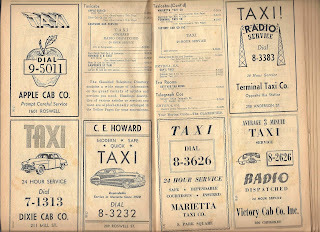 What about Howard's Taxi? Where was his office? 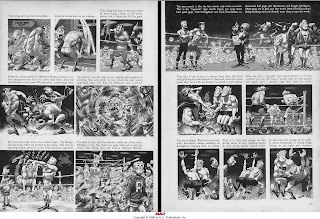 PANIC comicbook was a publication by EC Comics. Interesting, one of its competitors was its sibling. Both PANIC and MAD were published by William M. Gaines, who owned EC Comic books. 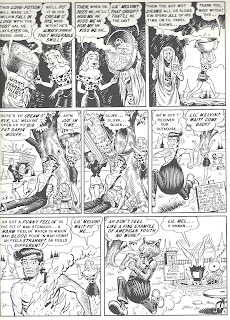 PANIC had an upper hand on the non-EC comics because PANIC employed the very same artists as MAD, and MAD sat the standards – all the lampoon comics wanted to look like MAD, it was the best seller. 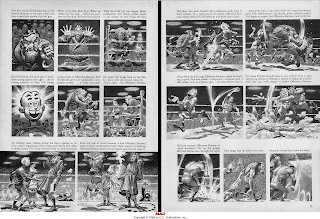 Artists Jack Davis, Wally Wood, and Will Elder did MAD and PANIC. This was during a time that comics were getting a lot of criticism for their gruesome stories and pictures. EC also led the parade on that, publishing such comics as TALES FROM THE CRYPT, SHOCK, etc. So, I think Gaines was doing a reshuffle of his publications. 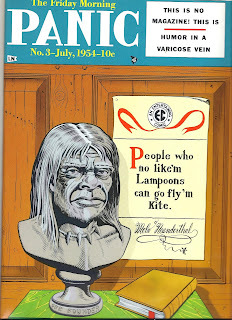 He knew now, with the new pressures, MAD was doing the best – so why not have another lampoon-type of comic? This story is drawn by Will Elder, which was the most popular trend setter at MAD. 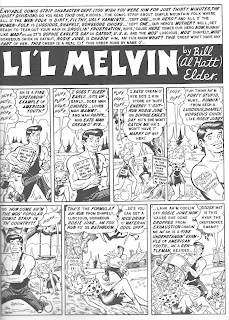 In this story, LI’L MELVIN, frankly, it was like Elder was a loose cannon. 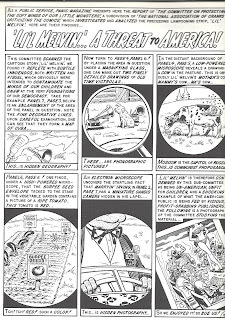 I don't think he had the Kurtzman guidance because Kurtzman was not the editor. Elder put more little tiny side jokes than he put in MAD. I think he also wrote it. I read that he had written some of his own stories for PANIC. In comic books many times there are more going on than meet the eye. And sometimes even a double story that only the fellow artist or writers can appreciate or get the full-jest of. 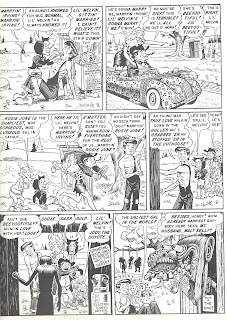 For instance, once Harvey Kurtzman carried a sample of his art work to a newspaper in New York City, and the man over things like that was Walt Kelly. Of course, Walt also did the comic strip POGO. Walt Kelly, according to Kurtzman, gave Kurtzman “the bum rush” out of the offices. Harvey Kurtzman was hurt and offended. 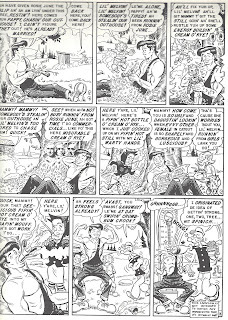 Elder and Kurtzman were friends, notice how he treats the POGO characters in the story. 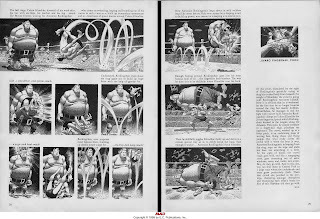 Another thing, you might not realize is the story behind the story of JOE POLOOKA’s characters popping up in the story. 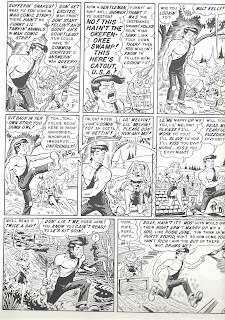 Al Cap, the creator of LI’L ABNER, and Ham Fisher, creator of JOE PALOOKA, were bitter enemies. 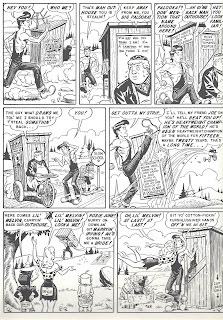 Early in Al Capp’s career he worked for Ham Fisher doing a running story about hillbillies in Kentucky or maybe Arkansas. 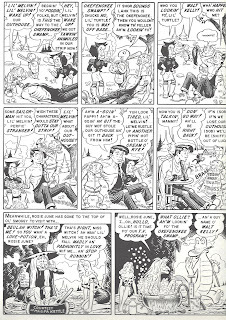 When Al Capp went out oh his own he did a strip similar as the strip he did for Fisher. Thus, a bitter court fight over copyright infringements. Ham Fisher lost and it wasn’t long until he took his own life… so, bare that in mind when you see the below story. Another interesting thing is the last page where Elder gives an almost raspberry salute to all those "concerned" parents and investigating committees and others critical of the newly innovation of comics. Today was the Bell Center’s 20th Reunion here in Marietta. Many of us who used Larry Bell Park for sports, recreation, and entertainment back in the 40s, 50s, and 60s have a reunion to come and celebrate living another year. And some of us can’t wait to start pigging out on the delicious barbecue chicken breasts and barbecue pork and all the sides. We all have Georgian accents. ZZ Top or a Smith Brother? * Nope! Neal Lawrence is the organizer. Neal did a great job putting all this together. And the whole time he seemed very relaxed and on top of everything. He knew all and saw all. I think credit should be given to the Mrs also. Rock/Eddie Hunter roamed around and took pictures. They are not anything special. They are just pictures people at a common watering hole enjoying company with each other – like they did in their formative years 50 or so years back – only this time they can drink their beers legally. But, they still have to watch to not get caught smoking. So, on with the pictures - Let them roll Rock! Or maybe Rock & Roll? *However, Neal plays Santa Clause during the Christmas season.